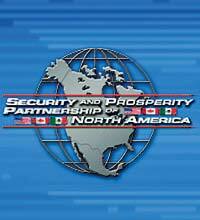 A look at the coming year has to start with the question: Whatever happened to the much-discussed Security and Prosperity Partnership of North America (SPP) with its plan for North American integration in 2010? However, if you look at the official SPP website, you might believe it has been disbanded. Following a series of press re-leases in August 2009, the site simply reads: This website is an archive for SPP documents and will not be updated. President Calderón and President Obama welcome Prime Minister Harper’s offer to host the next North American Leaders’ Summit in 2010. We will continue to work through this North American Leaders’ Summit process, in an inclusive and trans-parent manner, for the common benefit of the people of Mexico, Canada, and the United States. Despite the demise of the SPP, many of its crucial objectives have already been implemented or continue to move forward through other initiatives. In essence, the North American Leaders’ Summit is the same working group that has met every year since 2005. It is this group that maintains the agenda for the integration of North America. For their August 2009 meeting, U.S. President Barack Obama, Canadian Prime Minister Stephen Harper, and Mexican President Felipe Calderon met in Guadalajara, Mexico. •	Regional cooperation on the H1N1 flu pandemic. In addition, the group began discussions of other “hemispheric affairs” such as the political crisis in Honduras. The broadening of rogue influences in Venezuela and the economic teaming of Brazil with Russia, India and China (BRIC countries) created a new set of challenges and priorities for North American leadership. 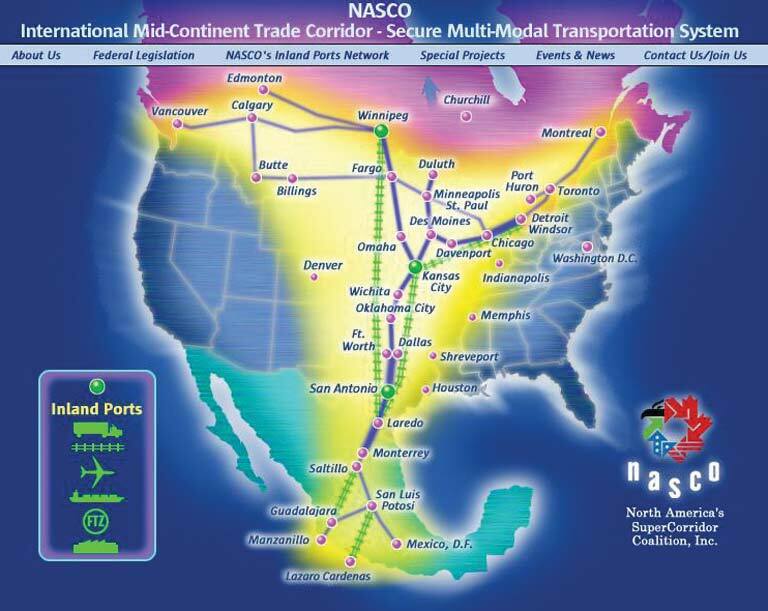 NASCO’s initiatives have profound potential to transform the entirety of the Corridor into the single most attractive location to retain, expand and attract new business for the international trade, manufacturing and transportation industries, especially global supply chain and logistics and shipping industry activities requiring the highest-efficiency, lowest-cost operating environments. As such, we have developed a network of contacts with public and private sector individuals, organizations, companies and public entities, institutes and centers of knowledge, as well as with regulatory and governmental entities from the local, state, provincial and Federal governments of the United States, Canada, and Mexico. The “shovel ready” infrastructure projects associated with this plan are already receiving funds allocated from the $787 billion American Recovery and Reinvestment Act signed February 17, 2009. It is estimated that $25.5 billion represents the highway portion of those funds. Since the 2010-2011 Recovery Act was signed, $19 billion has been obligated to fund more than 5,300 approved highway and other transportation projects (1,900 of those projects had already been started and have been linked to NASCO). The preparations for a united North America would not be complete without plans to secure the perimeter. The signing of the Civil Assistance Plan on February 14, 2008 laid a foundation for the military of the United States and Canada to cross borders to support each other in the event of a domestic civil emergency (civil riots, violent storms, health epidemics, or terrorist attacks). 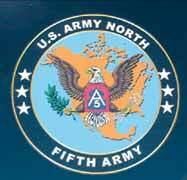 U.S. Army North Fifth Army (ARNORTH) personnel are preparing for just such an emergency as this article is being written. As the land-based component of U.S. Northern Command, it is their responsibility to conduct all training exercises as part of the program to integrate Department of Defense (DoD) forces into the larger federal response to a catastrophic incident. 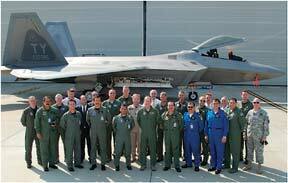 In the photo left, North American Air Chiefs Conference attendees pose in front of an F-22 Raptor from the 43rd Fighter Squadron at Tyndall AFB, Florida, where military and civilian officials from Mexico, Canada and across the United States met to discuss mutual homeland security operations (Photo by AFNORTH). Without media attention, the military cooperation of North American troops goes mostly unnoticed. Interestingly, the insignia patch (see graphic, above) of the U.S. Army North Fifth Army tells the story—an eagle on the background of the North American continent. The discussions and debates of “border security” that pierced the 2008 U.S. elections were mute—the definitions of borders and security were already being put into place. The United States currently provides $1.4 billion in assistance to Mexico under the terms of the Merida Initiative to confront the challenges related to drug trafficking and violence. Merida support ends in 2010. The responsibilities and challenges of keeping the borders open between the United States and Mexico will continue to be a topic for the blame game. For most of 2009, the discussion focused primarily on the use of illegal narcotics by U.S. citizens and the availability of firearms from U.S. companies. This placed the accountability of the problem squarely on the United States. Whether the debate results in continuing to treat the “drug war” as a police action, or whether it escalates to a formal military action on the border, the solutions will result in further loss of personal rights for the “greater good” of society for the citizens of North America. The handwriting is on the wall. Since the inception of NAFTA, the road to the North American integration was paved with a promise of economic prosperity for all. The global financial meltdown may have slowed the progress, but the goal remains the same. Originally, the goal of a single North American currency was proposed for economic unity. With the impending demise of the dollar as the world’s reserve currency, a new North American currency is inevitable—regardless of public opinion. In fact, the circumstances have been orchestrated to such a degree that a new currency will probably be demanded by the citizenry to replace the hyper-inflated dollar. The political characters of the North American Leaders’ Summit and the acronyms of the associated organizations may change, however, the goals and the mechanics of integration are still the same—and very much on target to move forward in 2010. Next month, we will look at what is on the horizon for Israel and the Middle East in 2010 and beyond. December 2009 Personal Update NewsJournal.